94 CEO Exits in November; Lowest Total CEO Changes Since 2004 | Challenger, Gray & Christmas, Inc. The number of Chief Executive Officers leaving their posts at U.S.-based companies fell in November to 94, 10.4 percent lower than the 105 departures announced in October, according to a report released Wednesday by global outplacement consultancy and executive coaching firm Challenger, Gray & Christmas, Inc.
November’s total was 11.3 percent lower than the same month last year, when 106 CEOs announced their exits. Challenger has now tracked 1,065 CEO changes so far this year, 7.3 percent lower than the 1,149 exits announced through the same period last year. This is the lowest 11-month total since 2004, when just 607 CEO changes were tracked. The government/non-profit sector continues to lead all sectors in announced departures, with 173 exits, 15 of which occurred in November. This is down 11.3 percent from last year, when 195 exits were announced. Financial companies led November exits with 19, bringing the year-to-date total to 107. Companies in the health care and health care products space announced ten CEO changes, as did hospitals. Hospitals have announced 102 total exits through November, while health care companies have announced 94. Computer companies announced seven exits last month, with a total of 89 for the year. 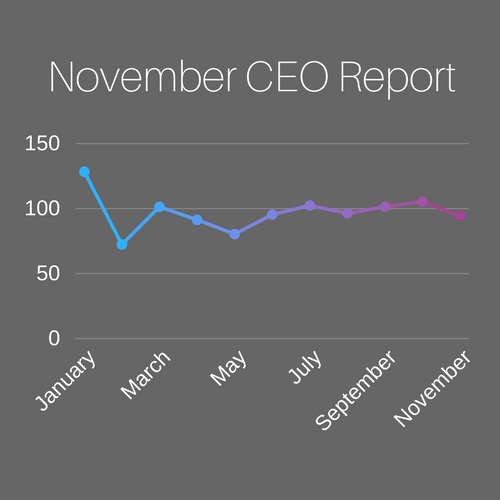 This is down 25 percent from last year, when 120 CEO changes were announced through November. California continues to announce the highest number of CEO changes, with 129 for the year, eight of which occurred in November. Texas follows with 98 departures. New York announced 64 CEO changes through November. A majority of CEOs (328) have stepped down from their positions into either a board seat or another C-Level position. A total of 33 CEOs announced plans to retire last month, bringing the total to 288 exits for this reason. Another 160 CEOs resigned so far this year, and 73 found new positions in other companies.